Studies have shown that keeping your staff active in and out of work can see your business acquiring more than just healthier employees. With gains including enhanced communication skills, better cohesion between staff and heightened success, who wouldn’t want a more active workforce? It’s no secret that living an active lifestyle has many health benefits beyond simply ‘keeping fit’. Incorporating exercise into your routine can lead to increased productivity and improved concentration, not to mention the positive impact on your mental health and wellbeing. And these benefits don’t disappear when you enter the workplace. Read on for some simple tips on how to get active in the office, so that you too can reap the rewards. Although standing up doesn’t necessarily count as exercise, it’s certainly better for you than sitting down all day. The main point is that your staff have a choice. It’s moving about whilst remaining focussed and productive. There are no surprises that several studies have shown height-adjustable workstations to increase users’ standing time at work. What may come as a surprise are the other benefits that come with standing more during your working day. This study from 2011 showed that after 7 weeks of using ergonomic desks, upper back and neck pain in staff was reduced by 54%, and participants in the study also benefited from improved mood among other positive outcomes. A more recent year-long ‘Stand Up to Work’ study conducted by Steelcase concluded with similar findings, stating that overall “height adjustable workstations help productivity, concentration and improve overall health”, even outside of the workplace. Find out more about Steelcase’s cutting-edge workplace furniture. If you have the space, allocating an area within the workplace that can be used for things that don’t involve work is an easy way to encourage increased activity. Simply having a flexible room or area to be used for anything from a lunchtime yoga class to a stand-up meeting gives your employees the option of getting active if they want to. If you don’t have a large space, use your imagination. When the sun is shining, get outdoors and organise a lunchtime walk for your colleagues so that everyone has the chance to get away from their desks. There are other fun and creative things you can do to get people up out of their seats too. 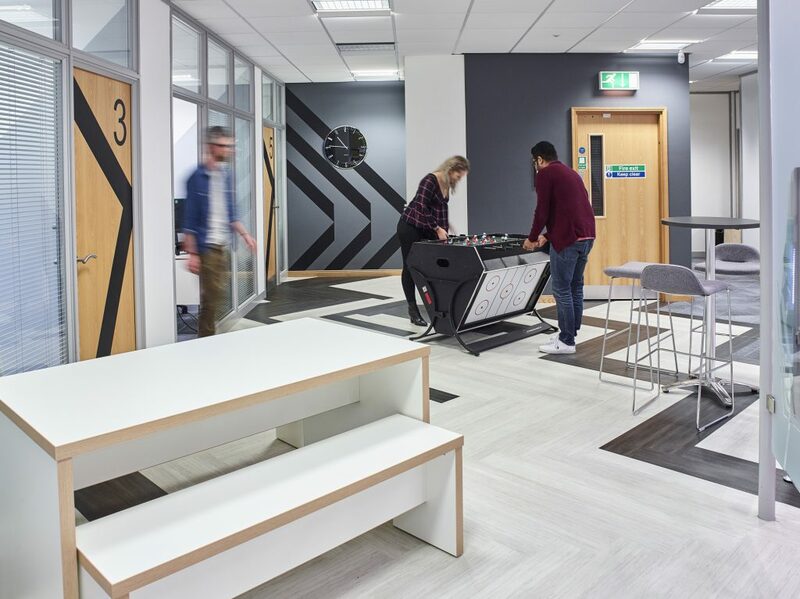 In our project for RG+P Architects, we incorporated table football into the staff break area as a simple way of getting people moving more and talking to each other during their breaks. 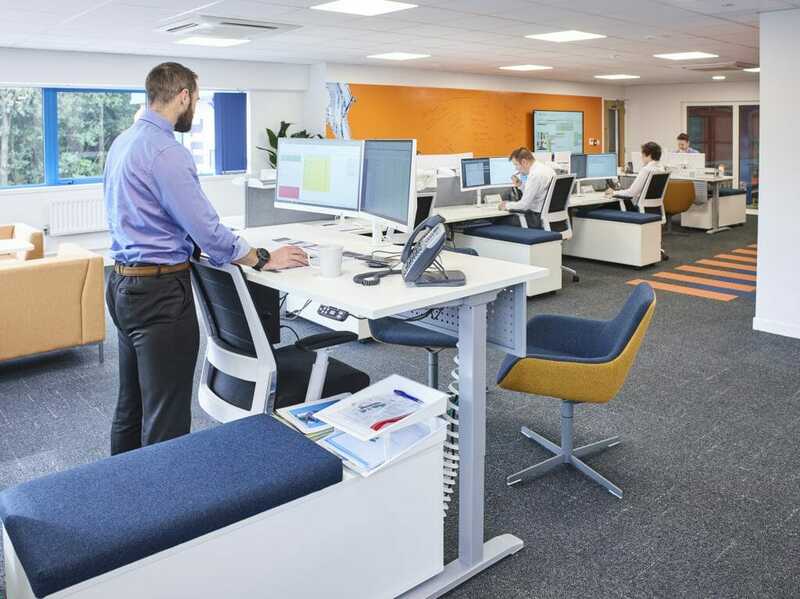 Offering alternative workspace, or being flexible with where people can work throughout the day also encourages people to be more active in the office, and provides the added benefit of avoiding staring at the same screen in the same environment all day. If, like us, you’re not the sportiest group of employees, this may sound like a non-starter for you. But don’t go discounting this one just yet! 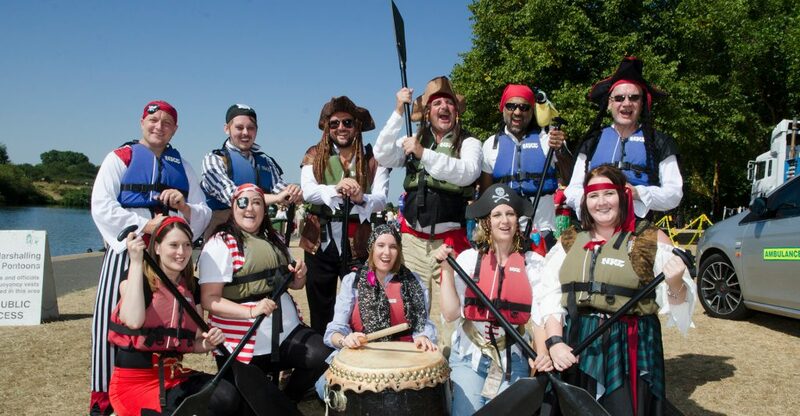 If we can participate in a longboat race dressed as pirates, anything is possible (please see photographic evidence below). Aside from being a lot of fun, playing recreational sport with your colleagues outside of working hours can lead to positive outcomes inside of the office too. We’re not talking Champions League football here; you can try any sport if it means getting together as a team to blow the cobwebs away once in a while. With all of these gains to be made, it’s worth putting in that extra bit of time to organise some fun sporting activities that your team can do together. So, what are you waiting for? Get those trainers on and encourage everyone in your office to start getting active! Want to create an active office environment? Let our office design experts help you create a workplace where your staff can thrive.